Denim 24 25,26 27,28 28,29 30,31 31,32 32 33. Manequin is small size. Length 10.25. Apparel Size Chart. Order Changes. Im happy to work with you to resolve issues, should any arise. Cute graphite print flats. Cute with shorts, skirts and jeans. 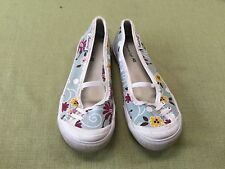 J.Crew Lucy Pointy Toe 1" Heel Florals Shoes. Reasonable rates. No Stains, Tears, Or Scuffs.in excellent conditions. Pre- owned light wear low heeled beaded and sequined pumps. Size 9 , B width. Soles show some wear but the heels are still in good condition. I only wore them a few times but they are very comfortable and look great with jeans or they can be dressy too. Denim With White Embroidery. US Size 9.5 M.
" GEOX " SIZE 39 ( U.S. 9.5 ). ITALIAN LEATHER. Designer/Label - Ivanka Trump "Maggie". Ann Taylor LOFT. Kate Spade. Pattern - Floral Lace. This section will auto expand to fit your content. 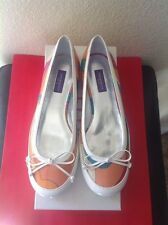 Special Details - Slip On, Peep Toe, Platform, Tried On Once, Excellent Condition. Pre owned almost like new. Minimal signs of wear and tear. See pictures for visible details. Black leather upper with pink and red daisy flowers.Kitten Heels. These are so stinkin cute! YS Fashion Mules Beige Floral Rhinestone Pointy Toe Beaded Gold Trim Sz 5.5 This is a fabulous pair of pointy toe mules by YS Fashion. The color is beige. The fabric material is covered with rhinestones and beads. The shoe is also trimmed with gold trimming. The heel is 2 inches high. This is the perfect item to wear out in the evening to a club or to dress up a formal outfit. The versatility of this is amazing. The condition is excellent. The value is great. Will ship within 1 business day of payment. Thank you for your interest and support of our small business. Size: US 7M / UK 5 / EUR 37.5. Type: Classic Heels. Designer/Label - Loeffler Randall. Intimates and Sleepwear. Kate Spade. Pattern - Floral. Special Details - Open Toe, Bow Detail, Platform, Double Buckle Closure, Minor Wear On Soles And Insoles, Good Condition. From the Victorian Trading Co Rilla Mary Jane Buckle Shoes A sassy burnished toe is styled with stitching, gilded embellishments, and scalloped trim. Hand painted genuine leather upper. Velcro buckle strap closure. 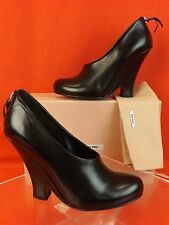 3" stacked heel, 1/2" platform height. Rubber sole. Clean with damp cloth. Designer/Label - Bandolino. Ann Taylor LOFT. Colors - White, Beige, Ivory, Blue, Pink, Red, Purple, Orange, Yellow, Brown, 2 Tone Green. We have a large selection of clothing, shoes, belts and handbags. These cute sandals are like new, in excellent condition. I only accept PayPal. I will combine shipping, and I only ship in the US. All bids are final, no returns. Comes from a smoke free home. Thanks for looking and happy bidding! Style: Chaperf. A perforated or laser-cut upper puts a playful touch on these leather lace-up sneakers. From ED On Air by Ellen DeGeneres. Oh my aching feet, said no one wearing a pair of Crocs! Women’s Crocs Baya Floral Graphic Clog Shoes . size 11. 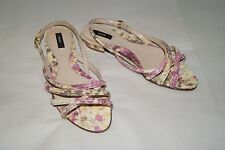 Women's Criss-Cross Material Tie Up Multi-Color Floral Summer Sandals. Hardly worn; excellent. Fun for the summer. Most used shoes, boots, sandals, etc will typically have wear such as scuffs, scratches, worn down soles and other imperfections. So beautiful, these shoes are like a work of art with a decidedly tribal boho vibe. Pointy Toe. J. Crew Italy. Floral Silk Flat. Ribbon Bow. Pink White Flowers. Fabric Uppers. Wear to Work. Intimates and Sleepwear. Designer/Label - Giorgio Armani. Kate Spade. Pattern - Floral Lace. This section will auto expand to fit your content. We have a large selection of clothing, shoes, belts and handbags. Our Tara slides combine an effortless sensibility with feminine charm. Slip them on with a breezy sundress or dress them down with denim. • 100% Leather. • Sole: Rubber. • Heel Height: 0.5". Intimates and Sleepwear. Designer/Label - Oscar De La Renta. Ann Taylor LOFT. Kate Spade. Style - Open Toe Heels. Pattern - Floral Lace. This section will auto expand to fit your content. Jimmy Choo.